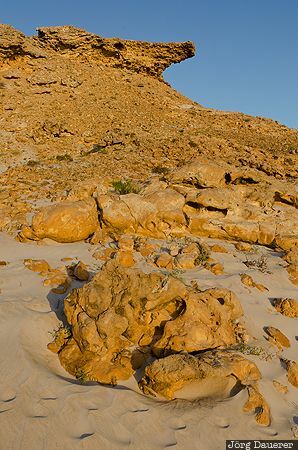 Rocks in the desert illuminated by warm evening light near Al Khaluf below a blue sky. Al Khaluf is in Al Wusta in the east of the Sultanate of Oman. This photo was taken in the evening of a sunny day in March of 2012. This photo was taken with a digital camera.